Kerry tells Madge that her reaction is senselessly violent, but Madge has had enough and tells Kerry to go to hell! When Madge and Harold have gone, Kerry is very upset and ssays she didn't want to fight with Madge. Joe tries to calm her down, saying Madge will come around in the end. Joe says he used to play with guns as a child, but Kerry thinks that was just because Joe didn't know any alternative. It's sexist conditioning in Kerry's book. She goes off to see Toby. Gemma has come to apologise to Dorothy. She wants to pay for the damage for the car and bike. Dorothy is pleased. 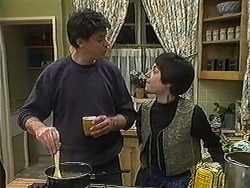 Gemma explains to Ryan that she's going to do some extra shift in the Coffee Shop to get the money together. She also tells him that she thinks Matt is a prat. Joe comes in and Melanie signs him up for the tournament. Toby is playing cars with salt and pepper shaker. Kerry talks to him about guns again, saying she's not trying to be mean, she just thinks that toy weapons get people used to the idea of hurting each other. Kerry says there are alternatives to guns, like Toby's magic set. 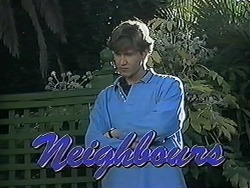 Ryan and Gemma are studying when Matt pops around to see Dorothy. Apparently he's got someone to do the repairs to the car at trade price - he's got a mate in the business. Dorothy is sceptical, but agrees as long as the workmanship is good. Gemma is surprised that Matt has gone to so much trouble - it'll take hundreds of dollars off the cost of the repairs. Matt awkwardly excuses himself. Ryan asks Gemma to go to a concert, but she doesn't want to go on a date - she had a boyfriend, Aidan, in Brisbane. Gemma and Harold are working out how many shifts she can do at the Coffee Shop. There aren't that many, so Harold says he could give her some odd jobs around the house as well. Gemma heads off to clean the car. Melanie, Joe, Clarrie, Christina and Eddie are practising darts. Melanie is hopeless, so Joe gives her some instruction. Matt sees Gemma cleaning the car and comes over to say hello. He says it's a pity Gemma won't be able to make it to the sixties revival (the concert) and says he admires Gemma for being determined to pay her own way. He says he can give Gemma an account of the concert when he gets back. Gemma tells Matt he has a swelled head! Kerry is talking to Dorothy about doing a toy fayre - so that kids can trade in violent toys for less violent toys. They can get the high school kids to bring their old toys in. Dorothy agrees to advertise the event at school. Christina and Matt are paired for the darts tournament, but noone wants to partner Melanie. Joe finally agrees. 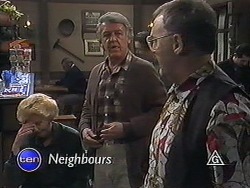 Madge and Harold come in and Joe tells them to leave him out of the argument between them and Kerry! He heads off home for tea. 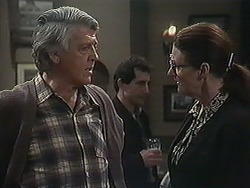 Clarrie asks Madge to join him for the darts tournament, but she says she's not available! Clarrie says he'll have to partner with Harold instead! Christina tells Melanie that Caroline has a new boyfriend who Paul hates. Melanie drags out of her that Caroline is going out with Jim. Melanie is shocked and Chrstina shushes her, telling her to keep it secret. Clarrie is mocking Harold's darts technique - Clarrie himself is very good. Christina and Melanie are having dinner now and Melanie is still banging on about Jim and Caroline. Kerry is making the tea. JOE: I'd give you a hand, but my old mum never gave me tea- sets to play with as a kid! KERRY: It's never too late to learn! Kerry has cheered up a bit and tells Joe about her conversation with Dorothy about the toy fayre. Joe says it's worth a go, so Kerry ropes him in to deliver leaflets and set up stalls! Eddie is still taking names for the darts tournament. Melanie says Eddie should put Jim and Caroline down(!) 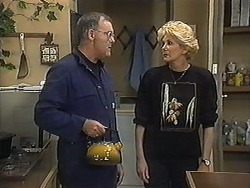 Dorothy comes in and tells Clarrie off for not being home early with the wine. He heads off, kissing Madge's hand! Madge comes in through the back door waving a white hankerchief. She apologises to Kerry for shouting at her yesterday and says that she's happy to replace the gun with another toy. Toby says he'd like a sheath knife or a model of a B- 52 bomber! Kerry reminds him that it has to be a non- violent toy. Matt comes over and gives Gemma a ticket for the concert, saying it's a peace offering. Gemma tells Matt that she can pay her own way, but Matt says it's his way of apologising to her. He insists that there are no strings attached so she finally accepts the ticket. He says he'll pick her up at 7.30pm.